After your makeup is finished, what do you need to keep it all in place for the rest of the day, especially in the heat of the summer? A makeup setting spray. Today I am going to review the Marc Jacobs Re(Cover) Perfecting Coconut Setting Mist. This makeup setting spray was inspired by Marc Jacobs' love of coconut water. 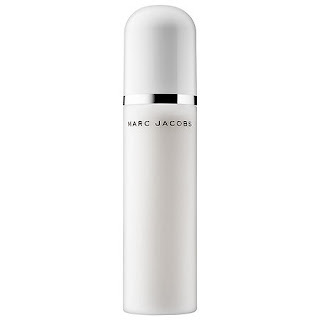 Marc Jacobs Beauty makes a great one that has the power of 24-hour performance behind it. Revive your glow and set and perfect your makeup with this next-level setting mist. It combines 24-hour performances with hydrating, skin loving coconut actives: coconut alkanes for lasting wear, coconut milk for deep hydration, coconut water for refreshing electrolytes, coconut polysaccharides to help condition skin and coconut-derived fragrance for a delicate, delicious experience. This fine micro-mist gives a healthy-looking, dewy glow to the complexion, at the same time locking in makeup so that it stays put and looks fresh all day long. Formulated with freeze-frame technology, it sets makeup for an entirely new sensation. Skin is left feeling comforted and nourished, never sticky or filmy. I think this is one of the best makeup setting sprays I have ever used. It smells absolutely divine. And it does keep makeup looking fresh all day long, especially in the heat we have had.. I spray it on immediately after doing my makeup, so that my makeup does not have any chance to melt off. The best way to use it is to spray it 10-12 inches from the face (with eyes closed, do NOT inhale) and spray 2-3 times. Let set. Voila! Your makeup will now be set for 24 hours. You can go to work, out do dinner and drinks and then dancing. You could even put it in the refrigerator for a more refreshing experience during the summer. I am very happy with this product and I hope it becomes a regular in the Marc Jacobs Beauty line. Marc Jacobs Beauty Re(Cover) Perfecting Coconut Setting Mist retails for $39.00 and is available at www.sephora.com, www.marcjacobs.com and SEPHORA stores. Like Marc Jacobs Beauty on Facebook: https://www.facebook.com/MarcJacobsBeauty; Follow Marc Jacobs Beauty on Twitter: @MarcBeauty; Follow Marc Jacobs on Instagram: http://instagram.com/marcjacobsbeauty# and Subscribe to Marc Jacobs on YouTube: https://www.youtube.com/user/MarcJacobsBeauty. Like SEPHORA on Facebook: https://www.facebook.com/Sephora?ref=br_tf; Follow SEPHORA on Twitter: @Sephora, Follow SEPHORA on Pinterest: http://www.pinterest.com/Sephora/; Follow SEPHORA on Instagram: http://instagram.com/SEPHORA#; Subscribe to SEPHORA on YouTube: http://www.youtube.com/channel/UC9YX5x_VU8gfe0Oui0TaLJg; Follow on Google+: https://plus.google.com/+ Sephora/posts; Follow SEPHORA on Wanelo: http://wanelo.com/sephora and Follow SEPHORA on Tumblr: http://theglossy.sephora.com/.